Fox falls into the category of light and speedy fighters. He's best recognized for his unimaginably fast falling acceleration, which works both for and against him, and his quick Reflector. Note: priority refers to the usefulness of the attack in a normal fight, and how much you should employ it during battle. Damage: 2% per attack; sometimes strikes for only 1%. A basic one-two followed by a flurry of ridiculously-fast kicks. It can be useful at low damage, especially considering duration, but can be punished if you aren't wary. Notably, the third strike can be air-dodged by most characters, with the proper timing. Like every never-ending combo attack, this is perfect if you can pin your foe against a wall. Damage: 6%, 7% down-forward, or 8% up-forward. A quick, basic kick with no frills. It's for when there isn't enough time for a smash, but too much range for a grab or Reflector. Damage: 8% in front and above, or 10% if the enemy is behind Fox. Fox stands on his hands and kicks behind him. It launches the foe upwards, but not by much. At low damages you can usually hit an opponent two or more times in succession, especially by larger and heavier fighters, but it can always be air-dodged. This is faster than Up Smash if you're looking up, but Down Smash is faster if you're looking behind. Fox crouches and swings his tail like a sweep-kick. Even if deals a tiny more damage than his ftilt, it's much slower, especially in the after-lag area, and you can't use it on the move like you can with an ftilt. Damage: 15% with C-Stick, or 21% when fully charged. Fox spins forward, kicking with both feet. This boasts the most range compared to his other melee attacks, and that's the primary reason you'll be using it. The secondary reason you'll be using it: it has the longest duration and least after-lag of Fox's smashes. But otherwise it's a typical Forward Smash. Frontal damage: 17% with the C-Stick, or 23% when fully charged. Rear damage: 13% with the C-Stick, or 18% when fully charged. Unless you're looking for an edgeguard match, this is the best KO attack in Fox's arsenal. It deals the most damage, can be used from a dash, and can combo from Dair. It instant-KOs from the least amount of damage on center stage, but near an edge, a Fsmash can usually outdo it. The flaw: This knocks a foe upwards, so there's no edge-guarding for you to be had if it isn't an instant death. Damage: 14% with the C-Stick, or 19% when fully charged. Fox splits, kicking low in front and behind. Importance: hits both sides strongly, opens incredibly fast for a smash, has the occasional tendency to launch at 0 degrees (as opposed to the typical 45), and can combo out of Dair more easily than Up Smash. It usually isn't your best bet for a KO, but that doesn't mean it doesn't hurt like hell. Damage: 5-7% damage (the closer they are to where Fox begins, the more damage they receive). Flying kick. Like virtually all dashes, it's weak, it's predictable, it knocks foes upwards. It is worthy in two regards: it has a rather long duration for a dash (so it can occasionally strike an attempted sidestep), and comboing an Up Tilt out of this at low damage rarely misses. Fox's ledge attack is comparatively fast under 100%, and has very impressive range for him. As you may have guessed already, Fox's aerial game is significant because he can fall so fast,. In some cases he can jump, land, then jump and land again in the same time it would take another character to jump the same height once. This makes it easy to mini-hop into most of his aerials attacks without much danger. Many of his aerial attacks are also surprisingly strong compared to some of his other moves. Damage: 6-9% (more damage dealt at the start of the animation). Kick-pose. This opens the fastest, and has a rather long duration. You can mini-hop, then hold this for most of the jump, especially if you quick-drop back down. Thankfully, landing lag is pleasantly short for this move, making it in even better suited as a hop-attack. Damage: 6%, 5%, 5%, 4%, 3%, or 23% if all hits connect. Five successive kicks; it isn't too difficult to hit with all five, so the damage this one move simple can dish out is amazing. If you're near the peak of his second jump, it's easy to see the last kick KOing off the top. While on the rise of a jump, perform this attack while still holding jump, and you'll be able to cover a little more distance than normal. This is only noteworthy when you're attempting to double-jump from a recovery, but could end up saving your life. Landing lag is a little slower than what you would hope for, but it isn't too heavy a burden. A quick kick behind. Since most of his other aerials dish out damage in multiple strikes, this provides a welcome safety in a quick and solid one-hit, especially at high damages when your foe seems to have an easy time escaping after your first Uair or Fair hits. Landing lag is moderate, but shouldn't be much of a problem. Fox backflips, kicking upwards with both feet. This matters because the second kick has impressive upwards knockback, especially considering you're already aerial while using this. If you land it at the peak of his second jump, it's a guaranteed KO on most stages. Unfortunately this has the worst landing lag of any of his moves, but you probably won't be landing from it too often considering it's an Uair. Damage: 21% if all hits connect. It's a typical drillkick, but in Fox's fast-falling hands it's amazing. If you drill an enemy into the ground at moderate-to-high damage, you can usually combo with (in order of ease) Reflector, Utilt, Ftilt, Dsmash, Usmash, or a handful of other moves. Yes, you can combo his strongest attack out of this--that is why you love it. Hop or drop into it often, but whenever possible, try to land behind your opponent. If you land it front it's usually easy for them to shield-grab you. Fox's grab is close-ranged. His grab-hits only deal 1% each, but they're mildly fast. But his throws are... just pathetic. They lack much damage, don't even think about KOing with one, and you can't chain any of them. Damage: 3%, 4%, or 7% when both hits connect. Fox holds his foe and punches, knocking him forward. Down Throw deals 2% more damage. Damage: 2% for the throw and 2% per shot (x3), or 8% if all hits connect (typically only does 2-4%). Fox tosses his foe backwards and blasts him three times. Even if the foe is at the perfect damage level, only the initial throw and first blast are guaranteed to hit, since the last two shots can be air-dodged (and at higher damages, all of the shots may miss). This only exists if you have to grab, and if you can throw them into some sort of hazard behind you. Damage: 2%, 2%, 2%, 2%, or 8% if all hits connect. Fox tosses his foe up and shoots him three times. There's even less chance than the reverse throw that the lasers will hit the target, but at least your foe becomes airborne when you use this (you may be able to combine this with an up-air or forward-air). Fox slams his foe on the ground and Blasts him several times. Nearly every time you grab, you'll want to finish with this throw. The hits are guaranteed, and even if the others were as well, this still has the most damage. Your foe is launched up and forward a little bit, which is a good zone for them to be in if you're looking to strike with Fair next. Damage: 2-3% per shot; more damage at closer range. Fox pulls out his gun and fires. Tapping the button repeatedly causes intense rapid-fire, but the shots will never cause flinching. The shots will, oddly, knockback shielding and trigger special combos. The gun's range is just short the span of Final Destination. Since you'll usually attack with this several times in a row, its damage decreases pretty fast because of the Stale Move factor. After about a dozen shots or so you might be dealing damage in less than one point per hit. Flashes, then dashes forward to attack any enemies in his path before coming to a sudden halt. The start-up and ending lag of this make it easily punishable, but it can successfully be used a surprise attack in the heat of battle. This doubles as a recovery attack; it works well if you dash straight towards the ledge, but going onto the stage or under the ledge can be fatal, so aim well. It's a common strategy to grab a ledge, drop off the ledge, double jump, then Illusion back onto the stage to attack an edgeguarding foe. The problem is it's too common, and most experienced players will see it coming. The solution: mindgame them into thinking you're planning it, then recover normally and safely. The timing is nigh-impossible, but by tapping B after the flash but before Fox dashes, you can halt the dash partway through. There seems to be two points where he stops: before dashing and halfway through the dash. He still slides to a halt, so the ending lag isn't diminished much (if at all). Charge damage: 2% per strike (x7), or 14% if all hits land. Launch damage: 14% up close, or 8% from a distance. Fox floats in place, engulfed in flames, then launches upwards--by holding the analog stick (or-dpad), he'll launch in any other direction you choose. When he's in inflamed floating, nearby enemies will take damage and be drawn in--and of course the launch deals some damage as well. This is mainly used as a recovery attack, but it can be surprisingly easy to mindgame opponents with this. But if they have a projectile or long attack range, they'll probably just smash you out of the attack before you can unleash it. When using any controller except the Nunchuk-less Wiimote, you can hold the analog stick halfway between the 90 degree (top) and 45 degree marks (upper-left or upper-right) notches in the controller. Doing this when choosing the direction of Fire Fox causes Fox to shoot up at a curved angle, which allows him to traverse around the jutting lips of some stages. Tapping this causes Fox to flash a blue shield, and holding it allows the shield to stay up. The shield reflects any incoming projectiles, even from a Lip's Stick or PK Thunder. Anyone nearby when Fox initially flashes Reflector will be struck and take a little damage. While holding the Reflector up, no damage is dealt. Reflector can be flashed in rapid succession, especially while aerial. Each flash pauses Fox's descent (and horizontal movement, if aerial). You can leap off the stage's edge, then Reflector-Flash near the edge to function as a bumper deflecting any enemies trying to recover. The Reflector flash works as a weak semi-spike (knocks an opponent down and to the side), which only makes edgeguarding with it even more useful. In Melee, this attack was known best for having the fewest start-up frames. In Brawl it seems to be just as fast, but new moves and new fighters may have matched or outdone it. Note: Fox cannot drop his Reflector while reflecting. Against "streaming" projectiles like Fire Breath or his own repeated Blaster, this can cause him to remain in reflector stance long after the controlling player has released . He surrounds himself in a fiery aura and says, "Here I come!" + ( or )+ or or He tosses his gun in the air then catches it. + He says "Come on!" while gesturing with his hand. Press it for only a split second when on Lylat Cruise or Corneria to hear a radio conversation between the other members of Team Star Fox (and sometimes, Team Star Wolf). This is easiest to pull of if you barely knick the bottom edge of the D-pad with your fingernail (or finger). Landmaster: It's the tank of Team Star Fox. Ride it to blow your enemies away. Hold jump to hover, tilt down to roll, tap left or right to spin, and press attack to fire the cannon. Rolling and spinning does damage to nearby enemies, but the cannon is easily the Tank's strongest attack. The cannon notably strikes anyone riding on the shaft, not just what's in front. If a slow character is standing atop the Tank, the driver can hover to the top of the stage to instantly KO his passenger. Faster characters, like Fox himself, will usually be able to dash off the tank in time to save themselves. This is notably a better tactic with Falco's or Wolf's tanks, since they can ascend faster. However, Falco's deals less damage with conventional attacks, while Wolf's disappears sooner. If you yourself are faced with Fox's Landmaster, dive for a ledge and hog it, refreshing your grab on it as often as possible to preserve your invincibility frames. If you're a floaty character like Jigglypuff or Kirby, hide underneath the stage as much as possible. If you're on an edgeless stage, you're pretty much boned, especially if you have little horizontal speed. In Giant Brawl, the Landmaster becomes giant. If Fox is just giant by the effect of a Mushroom or WarioWare, the Landmaster will be normal-sized. A special thing about this Final Smash is that it can also take enemies offscreeen, unfortunately, the same thing goes for allies. Fox generally does better against "floaty" characters (mainly Kirby and Jigglypuff). These characters generally rely on mid-air juggling opponents--Fox's ridiculous falling speed and Reflector-stalling make this significantly more difficult. His reflector also makes projectile-focused characters like Samus, Link, or Pit easier targets. Using Reflector, you can hover over them if they try to recover. If you're lucky, you'll Reflector-Flash PK Thunder back at them as the bolt emerges from their head, and they'll fall to their death as you Fire Fox back onto the stage. If you're not quite as lucky, they'll hit you with Thunder, then fall to their death as you FireFox back onto the stage, or, their thunder can also knock you back onto the stage. This works best if the target drops below the ledge before Thundering--which is common practice. Thunder-Reflecting when they're level or higher than the stage is a much harder task, but from these angles they won't be able to grab the edge as easily. If they miss the edge, you can jump, roll, or shield as they recover, then hit them with a Dair or another attack during their after-lag. Falco is much like Fox. 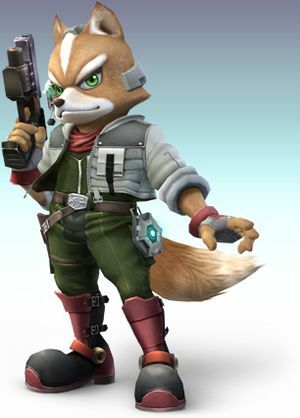 However, his Blaster has a small amount of knockback and a greater range, unlike Fox's. His reflector will cause certain problems to the Fox user that spams his Blaster. The key to defeating Falco is to take advantage of Fox's greater speed and Reflector to send Falco's Blaster shots right back at him. Wolf has extremely inaccurate recovery, a lower rate of fire and range on his blaster than Fox's, and a different side special attack. Priority one when fighting Wolf is to keep him at a manageable distance as his down smash can be devastating when Fox is at a high percentage due to its relatively high knockback. Don't be overzealous about using the Blaster as Wolf's Reflector is stronger than Fox's when it comes to reflecting projectiles. Above all, deal damage continuously and use the up smash when Wolf has reached at least 130%. Be cautious as a skilled Wolf can use his Reflector as a pseudo-Counter. This page was last edited on 25 December 2018, at 17:15. This page has been accessed 47,305 times.